(Boston, MA) An Inspector Calls forces its audience to confront issues of socio-economic depravity as symbolized by the neglectful behaviors of one upper middle-class English family. It’s arrival in Boston coincides with the news of an elaborate college admissions scam. The rich, powerful and entitled have been flaunting their capacity to harm for centuries. An Inspector Calls is not for the politically avoidant. On a rainy night in April 1912, the Birling family is celebrating the engagement announcement of Sheila Birling (Lianne Harvey) to Gerald Croft (Andrew Macklin) over dinner when Inspector Goole (Liam Brennan) arrives at the house. Daisy Renton’s (née Eva Smith) death by suicide is intrinsically linked to the Birling name. Goole questions them member by member until he discovers why and how the Birling’s are involved with the death. Housemaid Edna (Diana Payne-Myers), who stands in for the working poor, is ignored by everyone because it’s convenient. More information about this 1945 social realist play can be found HERE. 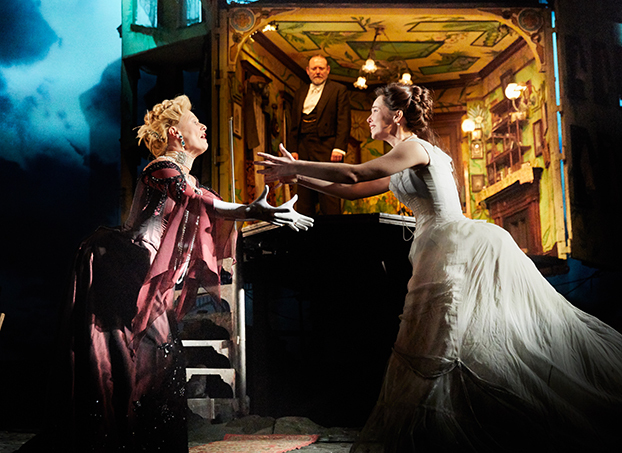 Daldry and ArtsEmerson have brought an intriguing piece of theatre to the Boston stage. Daldry has configured this drawing room drama to include aspects of an upstairs/downstairs dynamic. The set design is such that the Birling’s dining room opens to the audience to a set of stairs that the cast can ascend or descend to reach the stage’s floor. The Birling’s would never condescend to allow Goole into their most intimate rooms so it is necessary for them to use the stairs to reach him. This metaphor for class malleability, the ability to go where one wants when one wants is glaringly obvious. It doubles as a metaphor for the family’s descent into base behavior. The more that Goole reveals, the closer to the cobblestones the family gets. Photo by Mark Douet – Note the lit room in the back. Actors can climb the stage right stairs to enter and exit the functional dining room. Doors that enclose the room open to reveal the family in act one. The symbolism would not be possible without the work of the design team. Designers Ian MacNeil (scenic) and Rick Fisher (lights) recreate the world of fictional Brumley for the stage. There is weather that mists and sunshine that we miss. The stage looks the way cold and rain feel. It’s beautiful and mystifying. The music for An Inspector Calls is too loud. It’s so loud that it hurts the ears. Yet, the mics of the cast aren’t turned up loud enough. It was difficult to hear them. The balance needs reconfiguring. Sensitive patrons might bring earplugs for the first minutes and then remove them until the end of the show when the music starts again. Inspector is a solidly performed performance but the design elements steal the limelight time and again. Humans can’t keep up with technical innovation. Audience members interested in seeing this production please note that we humans are the ones creating the drama onstage (and off). JB Priestly’s original intent was to dry attention to the plight of the working class. His characters chide us that “we are responsible for each other.” We are. It behoves us to internalize the mistakes of this neglectful rich. It might be easier to be selfish than to be altruistic but that doesn’t make anyone less culpable the trauma it brings. An Inspector Calls is a three act play that runs 100 minutes with no intermission. This entry was posted in Drama and tagged 2019, An Inspector Calls, Andrew Macklin, ArtsEmerson, Boston, Christine Kavanagh, Emerson Cutler Majestic Theatre, Ian MacNeil, JB Priestly, Jeff Harmer, Kitty Drexel, Liam Brennan, Lianne Harvey, MA, March, Mark Douet, National Theatre of Great Britiain, Rick Fisher, Stephen Daldry, Stephen Warbeck, Terry King by Kitty Drexel. Bookmark the permalink.